For SeptemberFest 2017 we offered 45 minute ski and snowboard group lessons for beginners for only £9.99! • Freestyle features were out on the slope with tips from Snozone coaches! • Live music plus the return of our Ice Bar on the slope! 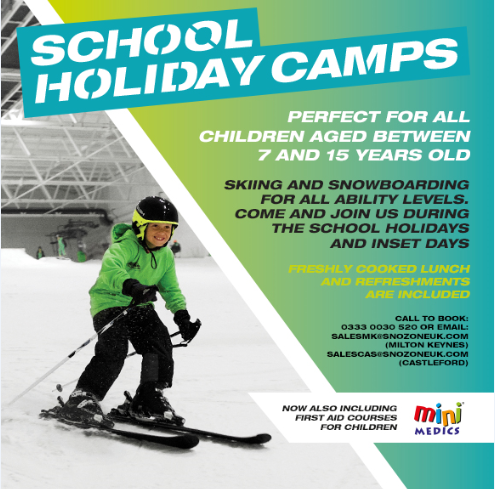 • Snozone Disability Snowsports lesson offer for only £9.99 (30 minutes). Snozone group lessons begin from 11 years of age. For more details please call our bookings team on 0333 0030520. British U16 women’s champion & Snozone This Girl Can ambassador Jade Walsh was on the Milton Keynes slopes for Septemberfest on Saturday 16th from 11am -1pm offering snowboard and freestyle tips.